Do you have ancestry in Brisbane? 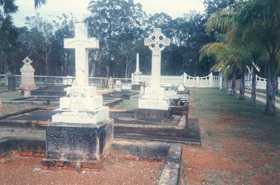 Cleveland Cemetery is located in in Cleveland, near Brisbane, on the block bounded by Russell Street (frontage), Wellington Street, Coburg Street West and Clarke Street. Some headstones remain standing, recording deaths in the 1860s and 1870s. This transcript of headstones was made in 1997/98. It's a wonderful genealogy tool for anyone exploring their family history or building a family tree.